A view of Fourth Peak Snack Bar at Ribblehead, you see rest of ride photos when the webmaster last visited this snack bar at this link. Fourth Peak Snack Bar at Ribblehead Opening hours: Open seven days a week in the Summer months and open at weekends during the Winter months. You can find more photos of the cafe in the following photo galleries on the website at this link. 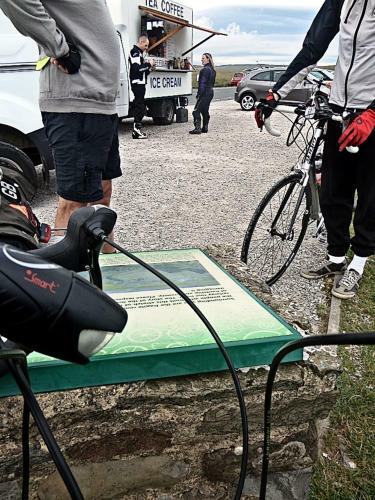 The following cycle routes stop at this snack bar: Click here to see full list of cycle route. You can view Google map showing where you can find the snack bar at Ribblehead at this link. You can find more photos of the snack bar in the following photo galleries on the website 17th July 2016 ride to Bainbridge. The following cycle routes stop at the Snack Bar: A 69.6 mile cycle route to Bainbridge in Wensleydale.